Spotted this in this months classic ford magazine also mention to our Steve’s book . Great design effort, very talented! Would be an interesting competition for everyone to show their ideas. The problem is, the ethos, mindset and nounce which the Capri had, and which the designers gave it, just does not apply today. It was the car for the everyman to have something special, a bit different, an image to show he thinks differently, to take risks, have fun, the chance for the average guy to be affordably flash. The car stood apart in the crowd. 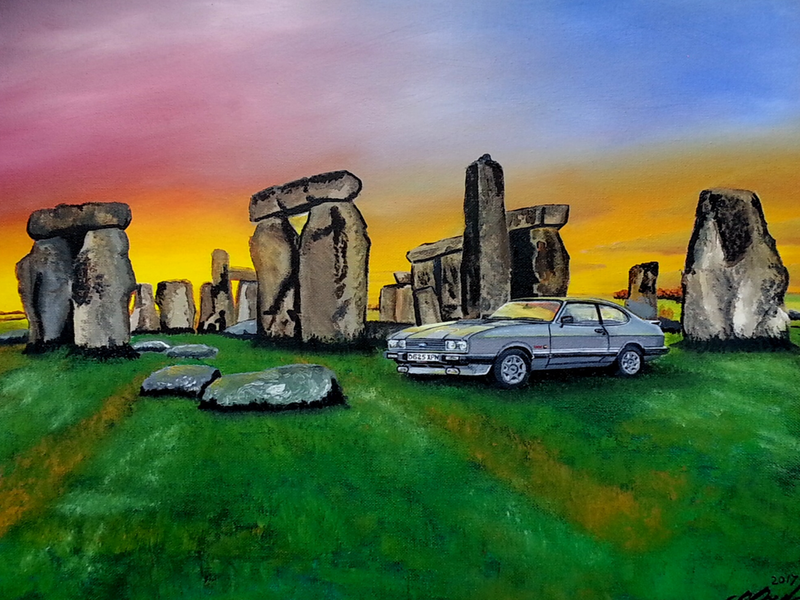 People were impressed, and still are as they mouth 'Ford Capri!' and point as we drive past them. That doesn't even happen to modern day Ferrari drivers, so no new Capri will have what the legend still has. Just like when your favourite group makes a comeback after years away and there's something missing, or they make a big movie version of your favourite classic TV show and it's not as good - I'd rather they just left it alone. pbar wrote: The problem is, the ethos, mindset and nounce which the Capri had, and which the designers gave it, just does not apply today. Totally agree with you, I use my Capri everyday for work and the amount of look's she gets considering she is a bit tatty are unreal, it does not matter what brand new car's are near by its my Capri that gets the look's and comments like 'now that's a proper car' or 'I knew she was 3 litre she sounds full of vengeance' those comments make it all worth it and I really don't think Ford will ever recreate that kind of car again. It looked like a generic modern car to me but hey, ho. Autocar had a more spirited go over Xmas. 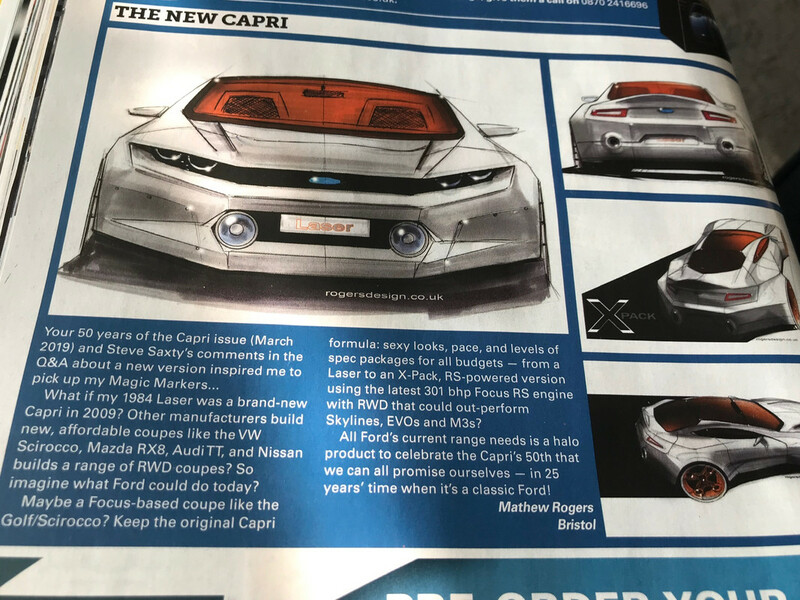 The well-known journalist there, Steve Cropley saw a Capri as a slinky all-active SUV-coupe. I exchanged a few emails with him over it later and said that I think, as some said here, made drivers feel special - indeed the tagline of The Car You Always Promised yourself was perfect. I think it's the not quite as catchy "The kind of car you'd always promised yourself if you could afford it". Give that man a prize for having trudged through the book! The original copywriter lives near me and, for those that have the book, you must love that pic of the GBX-windowed prototype. He's got his parents and flatmate standing in for Jackie Stewart and his parents in the test ad. That shot had never been seen before and so I was amazed when he dug it out. Always nice when your car gets a compliment. What she was eating a Grinstead pasty ? Jasonmarie wrote: What she was eating a Grinstead pasty ? What was the other person counting Andy ? ?